- Stunning soft beaches backed by dunes, cliffs and pine forests. - Blissful French holidaying with plenty to do for families, couples and groups. - The beautiful weather of the South, in the North West of France. The Vendée region, tucked on the West coast of France, offers picturesque French holidaying unspoiled by mass tourism and development. In this beautiful landscape estuaries give way to seaside towns, and rugged cliffs to fine sandy beaches. With 250km of protected coastline, this balmy region of France knows how to treasure its natural areas of beauty. Visitors to the Vendée region can stay in colourful seaside resorts and explore pine and oak forests, gently sloping beaches backed by dunes, crystal-clear bays and lagoons, and rivers and salt marshes stretching inland. With holiday apartments, houses and villas sleeping from two up to eight people, Summer France offers Vendee holidays to suit everybody, from a romantic escape, to a family holiday, to a group of friends on a last-minute getaway. Choose between La Résidence de L'Océan at La Tranche Sur Mer, Le Domaine de Fontenelles at Saint Gilles Croix de Vie, Les Mas de Saint Hilaire at Saint Hilaire de Riez or Le Domaine de Vertmarines at Saint Jean de Monts. With 140km of protected sandy beaches, the Vendée coastline provides excellent water quality with clean beaches. Beaches on the Vendée coastline are gently sloping, offering safe paddling for families with young children. With such beautiful water, it's hard to resist the range of water sports the Vendee region offers. With surfing, windsurfing, sailing and canoeing, not to mention the fishing on offer, there's plenty to try alongside lounging on the beach with a good book and soaking up the sunshine. When adventurous travellers get itchy feet, lace up your boots and take to one of the region's many hiking and biking trails. Trails weave from the kilometre-long natural sea-lapped spit, to the rugged cliffs and rich forests. Prehistoric sites are also abundant in the Vendée region. Monumental stone structures, abbeys and Châteaus lie dotted around the country dating back to Neolithic times. Museums and memorials document the history and culture of the Vendée region, from Richard the Lionheart and the late 18th century Vendée wars. Definitely worth a visit is the region's Puy du Fou adventure park. There are no rides at this park, but it's the second most visited French theme park after Disneyland Paris. The Guardian calls it 'France's antidote to Mickey Mouse,' and some three thousand volunteers perform stunts, thrilling shows and impressive animal displays to bring the region's rich history to life. The Vendée region offers fantastic food and drink, made with a passion for fresh local ingredients. Along the coast many seaside towns are working harbours, and restaurants serve fresh sardines, oysters, sole and bass, and shellfish. Open markets in most towns present fantastic local produce, including golden loaves of bread, cured meats and fresh fruit and vegetables. With large salt marshes in the region, salt is a key product. Here fleur du sel and sea salt is delicious (forget table salt, this is a whole different flavour). Restaurants are plentiful, from casual family-run brasseries to fine dining and Michelin-starred establishments, of which there are four in the region alone! When tasting the local cuisine it would be rude not to sample the wine of the area. With vineyards growing five grape varieties, local wine is widely available throughout the region in shops and restaurants. 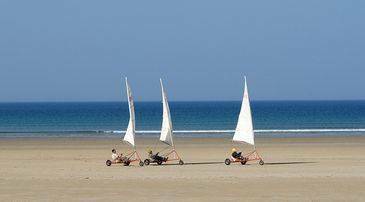 The hugely popular Saint Jean de Monts is a favourite with families. On the north of the Vendée coastline, Saint Jean de Monts boasts 8km of sandy beaches, which are all very gently sloping, providing safe swimming for young children. The resort offers plenty of child-orientated activities, with diverse cycle paths across forests and wetlands, while rollerblading is common on the esplanade. La Tranche Sur Mer on the southern Vendée coast remains untouched by large tourism and development. 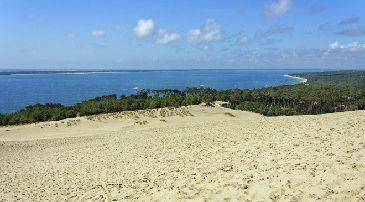 With 13km of sandy beaches and authentic scenery, La Tranche Sur Mer, nestled between sea, dunes and forest is a beautiful holiday destination. On the central stretch of the Vendean coast sits Saint Gilles Croix de Vie. A nautical resort, this village is home to the famous boat-builder's boat yard Bénéteau, plus there's a large marina to explore. Saint Gilles Croix de Vie is the largest French sardine port on the Atlantic coast, and local restaurants serve this delicious fresh fish in all kinds of dishes. The resort is well-known for its relaxed pace of life and pretty floral displays around the town. Nestled between the popular St Gilles Croix de Vie and Saint Jean de Monts, St Hilaire de Riez offers classic seaside holidaying. Long sandy beaches mingle with the rocky coastline. Sleepy seaside houses with brightly coloured shutters spill out on market days, and there's also a fun park for children to play in. Choose from our wide range of Vendée holiday rentals and book direct from the French specialists today.